Linking Aadhaar card to bank accounts, PAN card and mobile number etc. has already become mandatory. Now soon Facebook can ask for Aadhaar card details. Facebook has also started testing it. And it will affect a lot on its user. Discussion of Aadhar card linking is getting around. So far, you were linking the UID with bank accounts, PAN card and mobile number, but soon Facebook can ask for Aadhaar card. Facebook has also started testing it. Some users have also shared their experience. Some new users have shared screenshots, which clearly show that Facebook is checking the Aadhaar card but it is not compulsory. 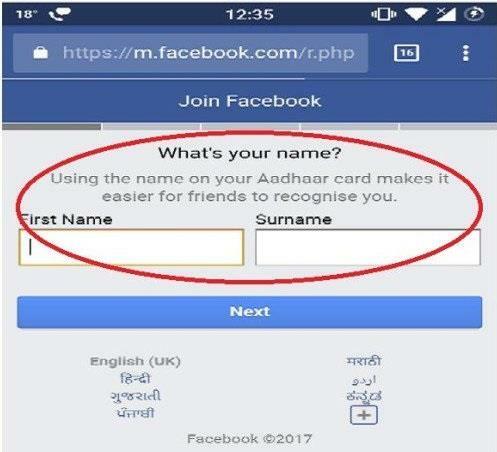 In fact, some new users have received a message from Facebook when creating an account, “Create an account with the same name as your name in the Aadhar card. This will allow your friends to recognize you easily. ‘However, this is happening on Facebook’s mobile site. Facebook is doing it for the prevention of fake accounts. Soon the social media company which is rain by Mark Zuckerberg will make it compulsory who are having facebook account it seed it with their aadhar card number. To make it clear that it is original account of specific user. Because in today’s time number of false account is increasing. And which leads to number of happening in our life. Like online fraud cases through various facebook account from various location and other like making false friend and doing prepaid recharges on the name of girl. Presently facebook is testing it and before it they have decided to upload same aadhar photo of user in fb account but after some protest this decision has been taken back by the company. But now they are requiring user same name as on aadhar card to identify the user originality. And this will reduce many criminal cases as well. This is of great benefit of linking aadhar with facebook social account and our prime minister narendra modi is the first person going to verify their account with aadhar. But there are some cons of this linking also. Like someone who still does not have this card will have to wait for account creation otherwise it is al around good decision.